For the last month or so Dustin and I have sought solace from the cold winter weather in hearty meaty sauces, stews, and chilis. This past weekend, with warm weather on the horizon, we looked to change tempo with a meat free weekend of cooking. Thinking of ways to make protein packed vegetarian mains my mind drifted straight to lentils. Lentils are by far my favorite vegetarian protein. 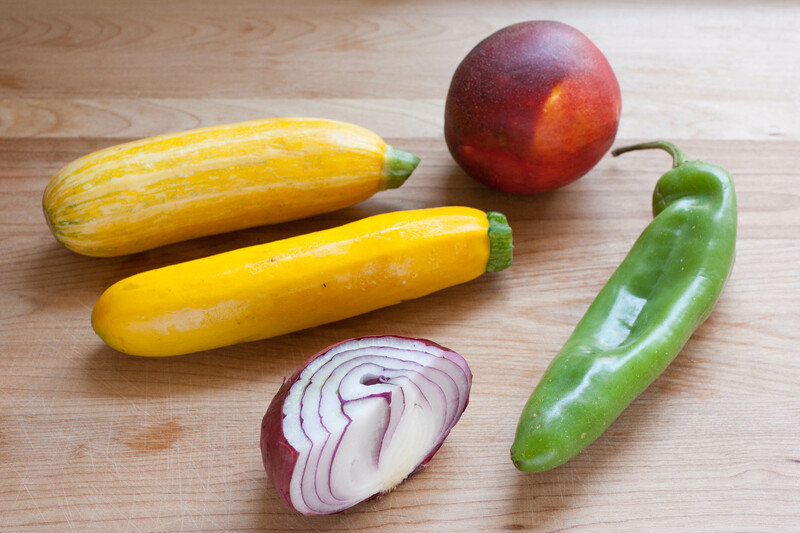 I love that they are so amazingly versatile, the many different varieties make them well suited for a variety of different types of dishes. 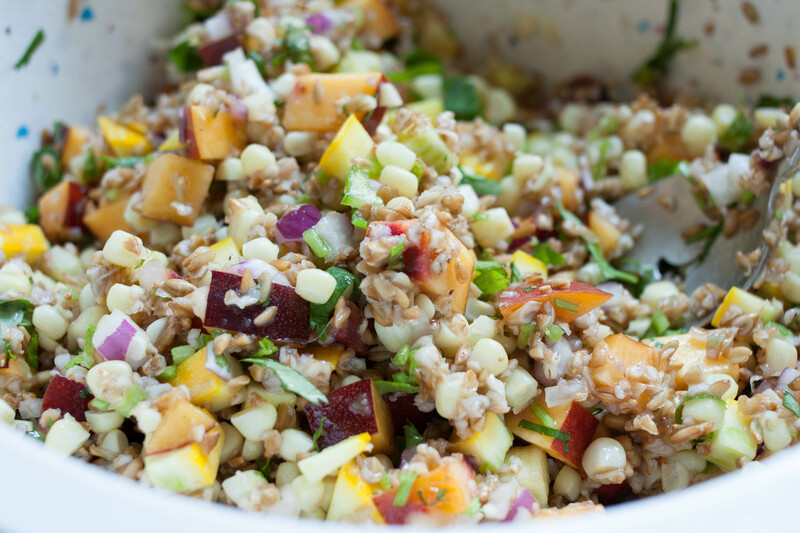 Firmer lentils such as puy and beluga add a nice toothsome bite to salads and can withstand longer cooking times without turning to mush. Yellow and red lentils, on the other hand, are easily transformed into smooth soups and make an excellent base for silky purees and dips. There are few cooks famous for vegetarian cooking, and even fewer who approach meatless cuisine with the same innovative zeal as Yatam Ottolenghi. 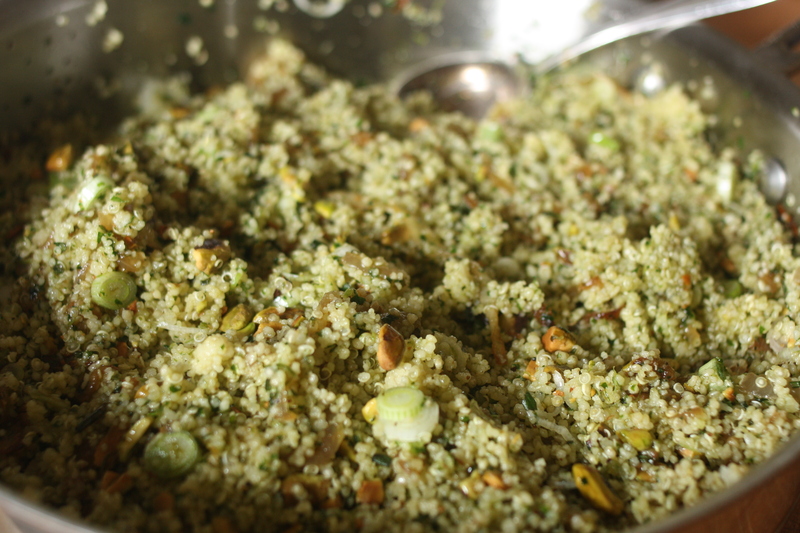 I love looking through Ottolenghi’s archived recipes on the BBC’s website. The hundreds of vegetarian recipes provide a breath of fresh air when my usual fail safe flavors prove boring and stale. This can be especially useful during the winter months when the variety of produce is limited and inspiration is hard to come by. 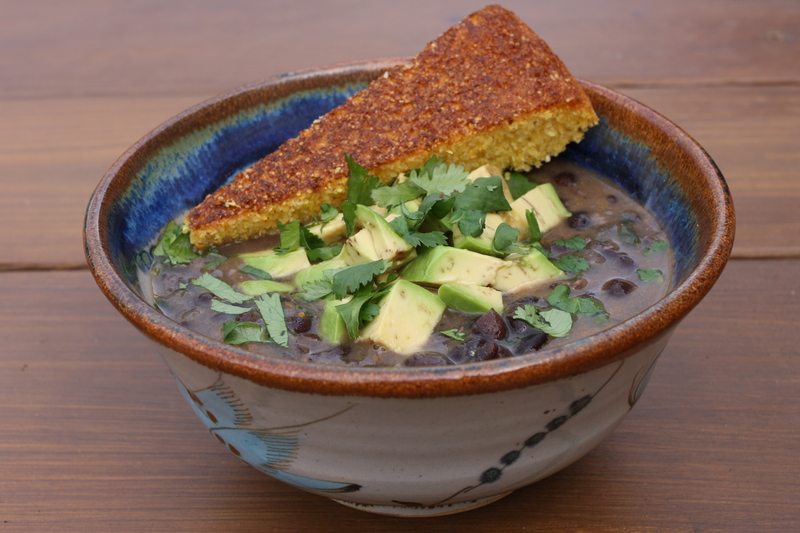 As if that wasn’t enough reason to scour the web for Yatam’s delicious dishes, many of his dishes offer creative ways to take advantage of dried legumes and whole grains, all of which are relatively inexpensive and incredible healthy. We typically have a wealth of stored legumes in the pantry but if you don’t have these on hand it is fun to peruse the dried goods section of Whole Foods (or other health foods markets that offer bulk grain bins) looking for new whole grains to try. I have been reading lately about many of the bargain options available at Whole Foods, it appears that many of their stores offer tours to show shoppers thrifty and healthy options. 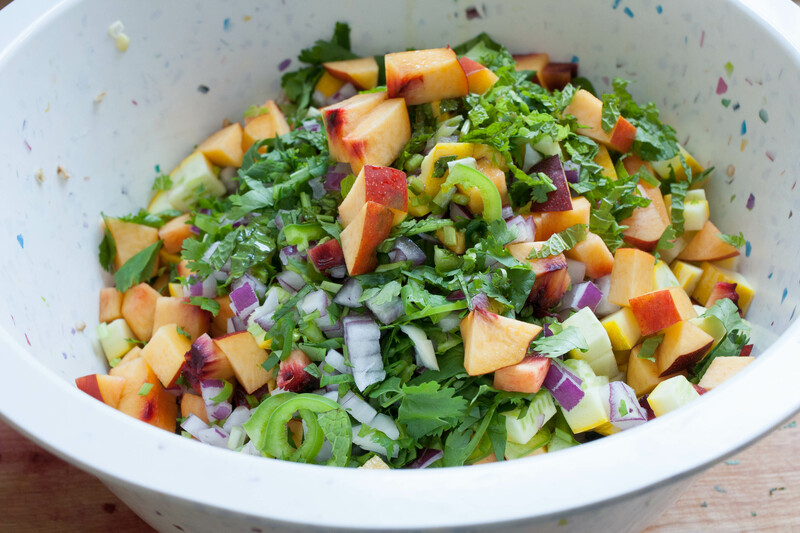 This dish certainly packs a healthy punch. The lentils themselves are rich in protein. 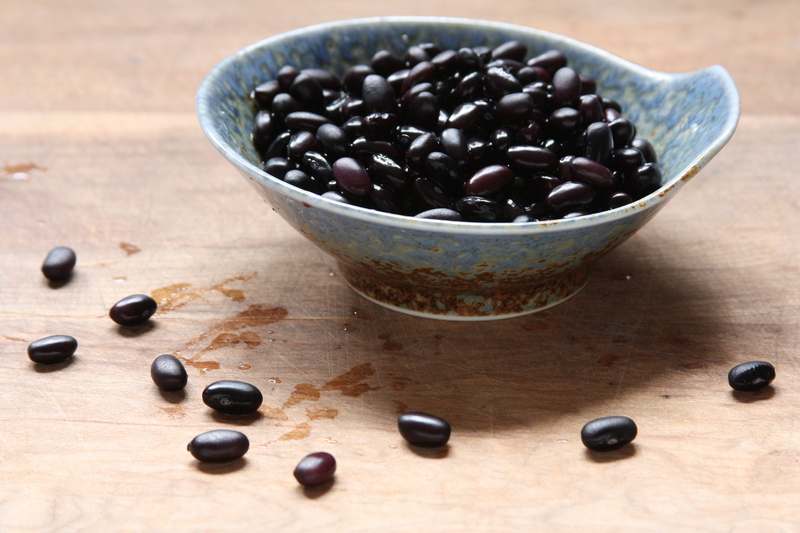 While they are members of the legume family, unlike beans they are free of sulfur an, therefore don’t cause the same “wind” issues as their beany brethren. Lentils have been a dietary mainstay since biblical times. They are, in fact, featured in the book of Genesis, where Esau sells his birthright to Jacob for a bowl of lentils. 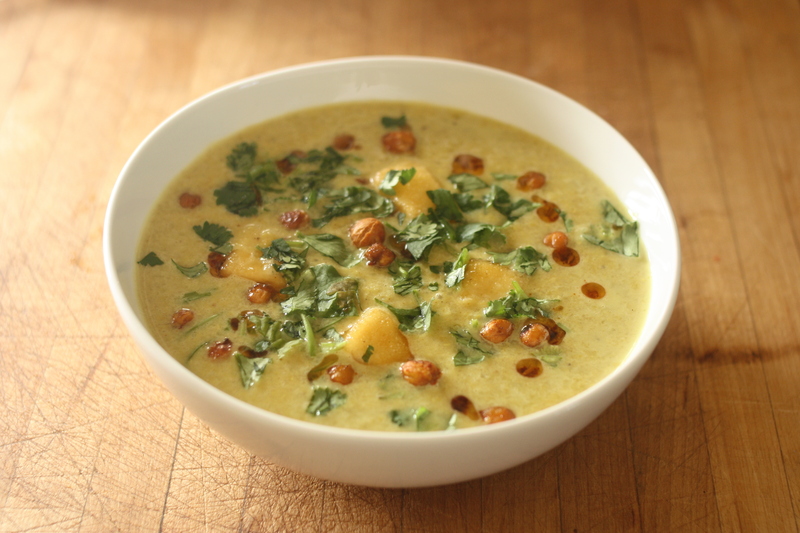 The coconut milk in this dish provides a nice substitute for heavy cream – which is more often used to create a creamy flavor in pureed soups. It also keeps this dish vegan friendly. I recommend using Chaokoh brand coconut milk, which is typically available at Asian markets – it is amazingly rich and smooth. While you can use lite coconut milk, I recommend using the full fat variety as it adds needed body and richness and helps the spices shine. The tofu and chickpeas are both “optional” – if you don’t have the time or don’t want to fry up the tofu it can easily be omitted. Both of these add a nice textural contrast to the smooth creamy soup. Heat two tablespoons of sunflower oil in a medium saucepan. Add the onion and on medium-low heat sweat for eight minutes until soft. Add the garlic, ginger and ground spices, and cook, stirring, for eight minutes. Add 900ml water, the coconut milk, lentils and lemon skin (not the juice). Bring to a boil, then simmer until the lentils are soft, about 20 minutes. Remove the lemon skin, add one and a quarter teaspoons of salt and some pepper. 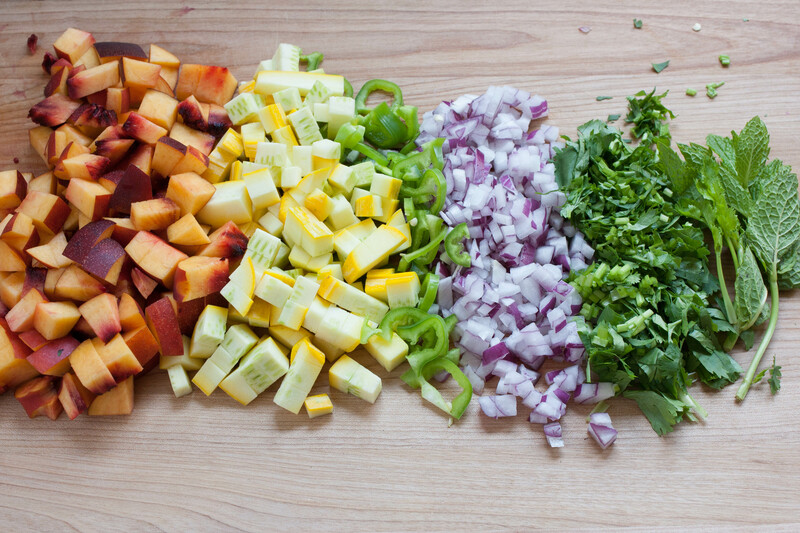 Allow to cool slightly and then blend until smooth. Taste and add more salt to taste. Wipe clean the saucepan and pour in enough oil to come 2cm up the sides. 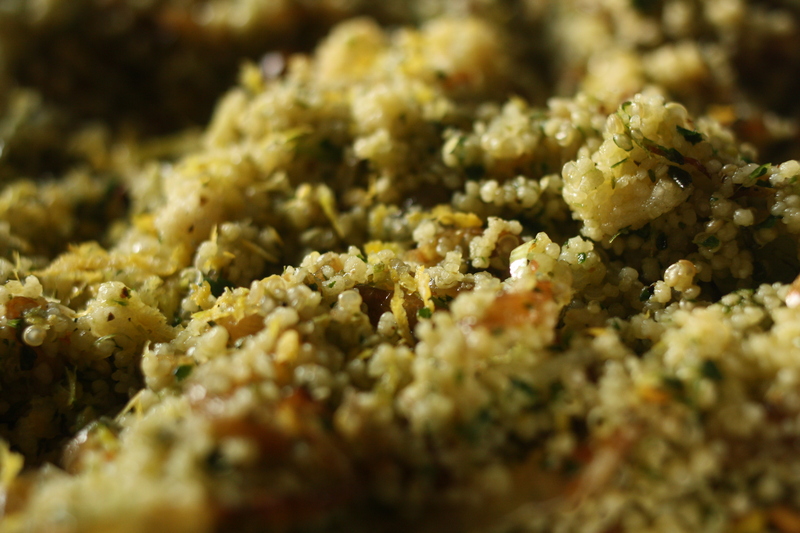 While the oil is heating up, mix the corn flour with a quarter-teaspoon of salt and some white pepper. 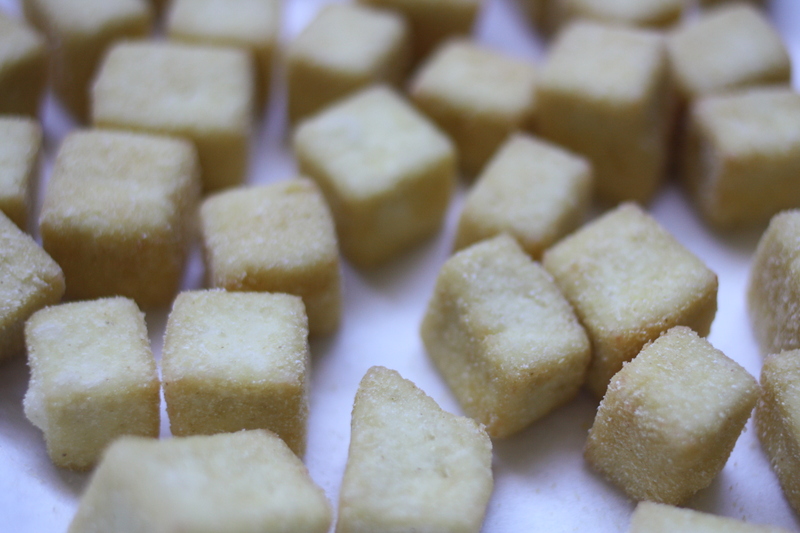 Toss the tofu in the corn flour, shake off any excess and fry in batches until golden, about five minutes (the oil must be just hot enough gently to fry the tofu). Drain on kitchen towel and set aside somewhere warm. 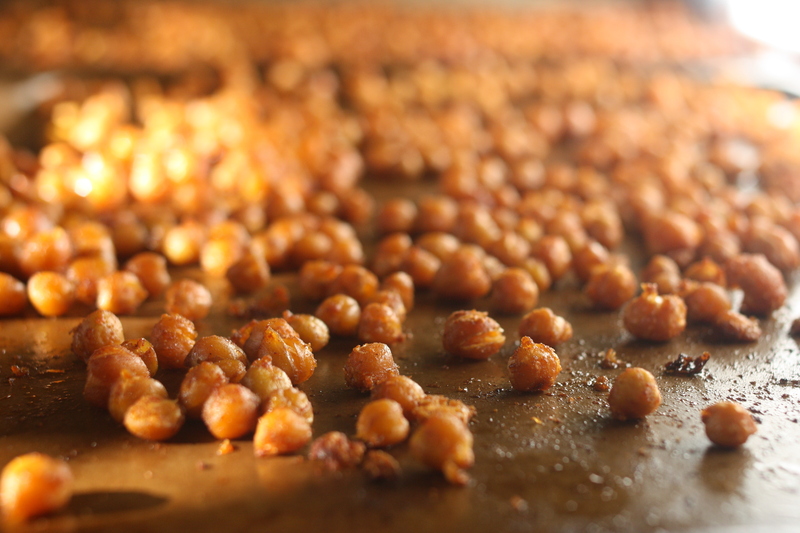 For the chickpeas – preheat the oven to 400 degrees. Toss the chickpeas with 1 TBSP sunflower or olive oil and the spices. 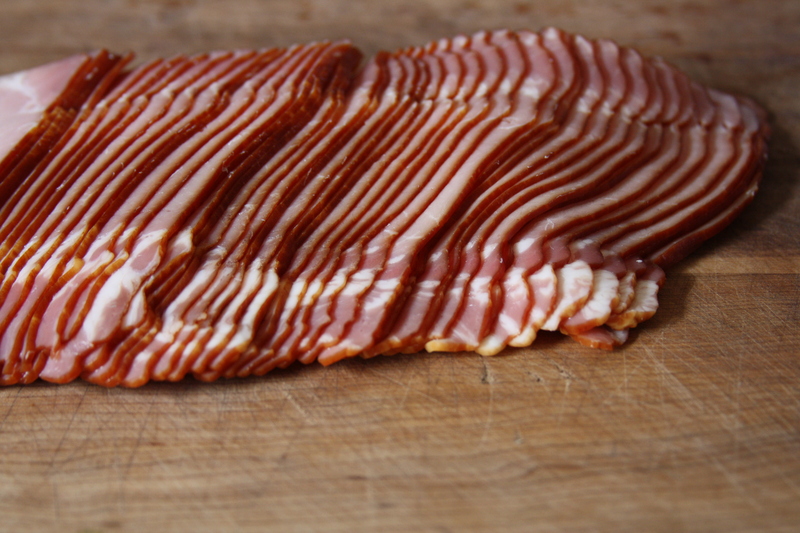 Spread in a single layer on a sheet pan and roast in the oven until browned and crunchy and 25 minutes. 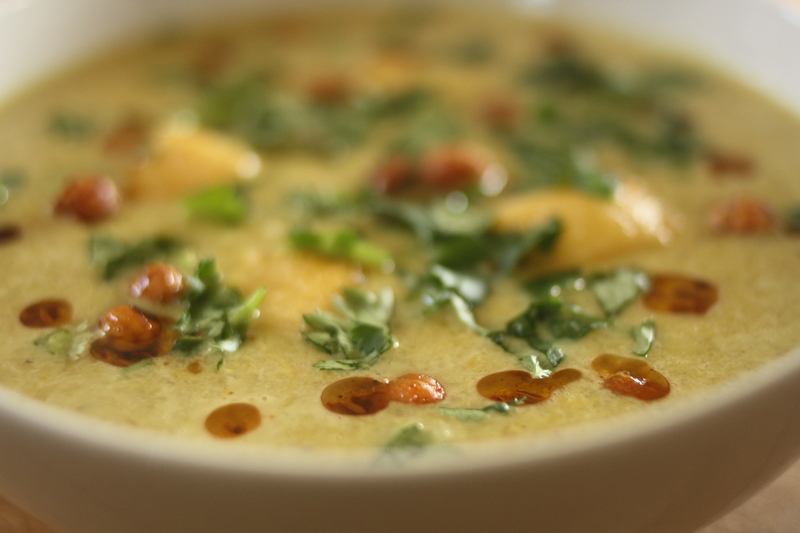 To serve, heat up the soup, stir in the lemon juice and divide between four bowls. Top each with some fried tofu, crunchy chickpeas, and a drizzle of the cumin and chilli oil, and finish with a sprinkling of cilantro. Those who know me know I love carrots. 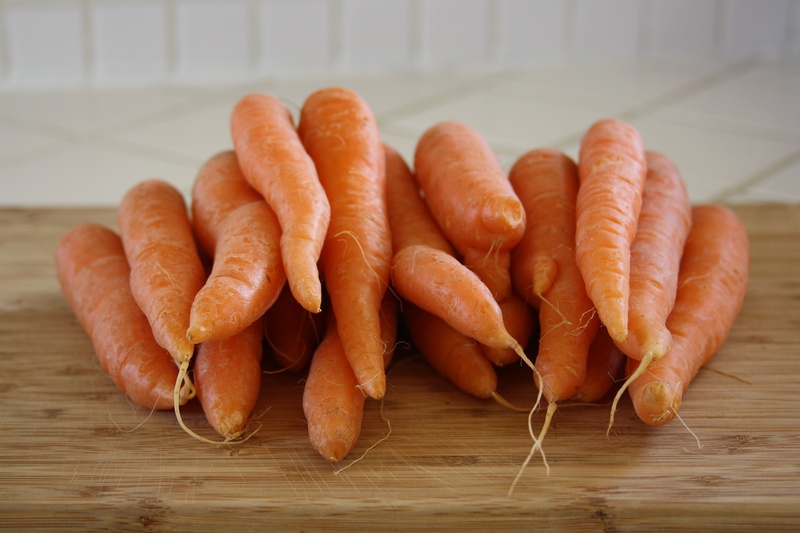 Carrots of all shapes, varieties, colors – I love them all equally. 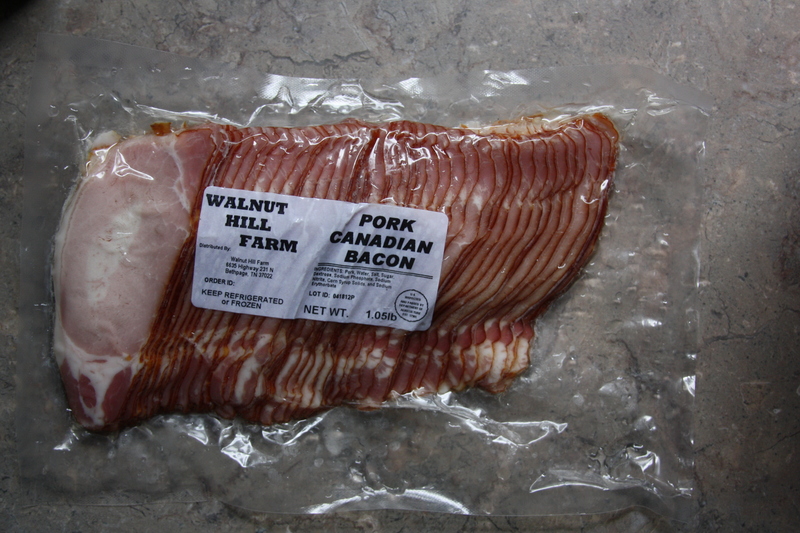 I love that they are so savory and yet when cooked, release an amazing amount of sugar. I love how they impart an essential and irreplaceable earthy sweetness on broths and stews. I love the sound, the snap, they make when you crunch them between your teeth. I love them so much that I once ate enough carrots to tint my skin (mainly my face and hands but especially the webbing between each finger) orange. I was ushered to the doctor by my mother who was highly concerned at my fake-tan-ish glow, and told I would need to go cold turkey on my favorite vice for a while. Perhaps it is the season, there aren’t a lot of enticing veggies around at this time of year, but I have been back on my “drug” of choice lately, it makes part of my (almost) nightly post-gym snack of carrots, raisins, and a bit of yogurt or turkey. I have, luckily, learned some restraint over the years, while the carrot habit has returned, the hue has not. And my favorite snack has found its way into other dishes as well. This last weekend Dustin and I took on the rather spicy carrot salad featured in my one of my favorite cookbooks, “Plenty” by Yatam Ottolenghi. The salad reminds me of one we frequently ordered at the middle eastern restaurant on the University of Delaware campus where Dustin and I had our first date. 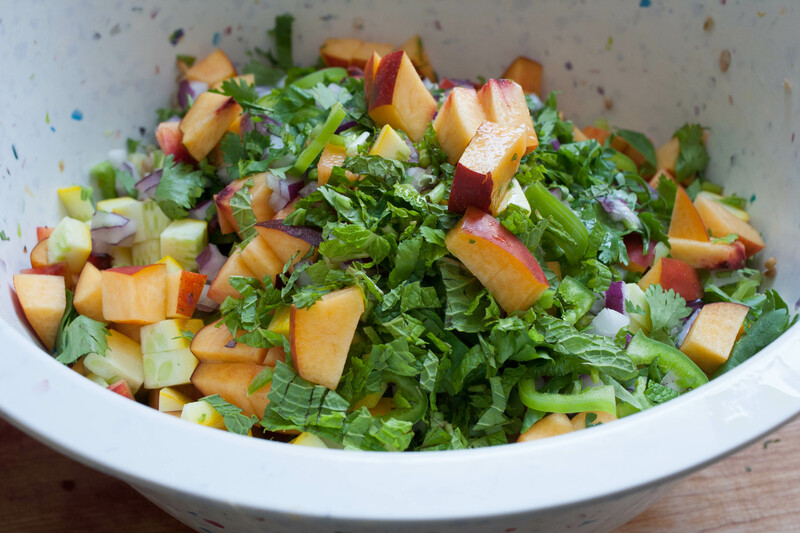 The al dente carrots mix with the herbs and spices to form a zesty salad that makes a nice side for grilled meats, a zingy addition to salads, and a great stand alone snack. Carrots are, unsurprisingly, quite good for you. Carrots are notoriously high in beta carotene, and powerful anti-oxidants. 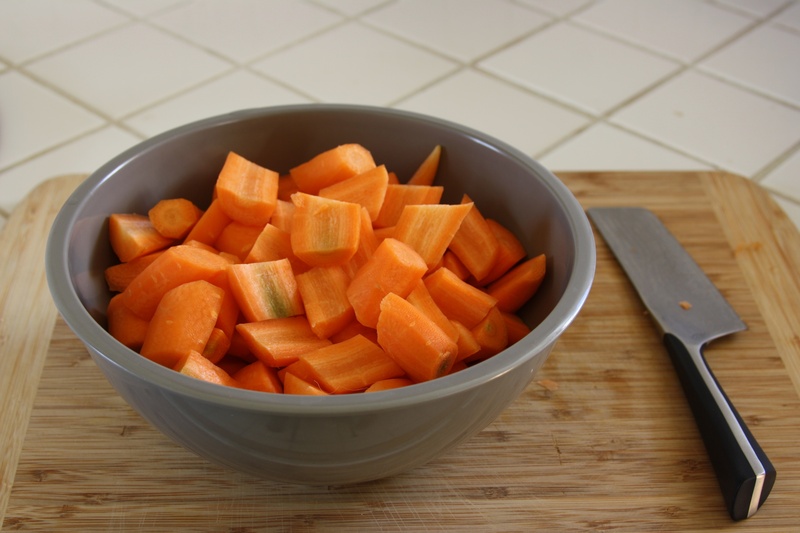 Carrots are also quite rich in Vitamin A, Vitamin K, and serve as a much needed source of fiber. Carrots can be grown nearly year round and are one of the most predominantly consumed vegetables in the US. China is the world’s leading grower of carrots but they have been widely cultivated in Europe since the 15th century. The original varieties grow in Europe were primarily red, purple, and yellow heirloom varieties. Carrots provide the most nutrients when eaten shortly after harvesting. Look for carrots that are firm and free of splits, preferable with the greens still in tact as the greens are an excellent indicator of freshness. The greens are indeed edible and can be cooked along side other dark leaf greens in traditional “greens” dishes. 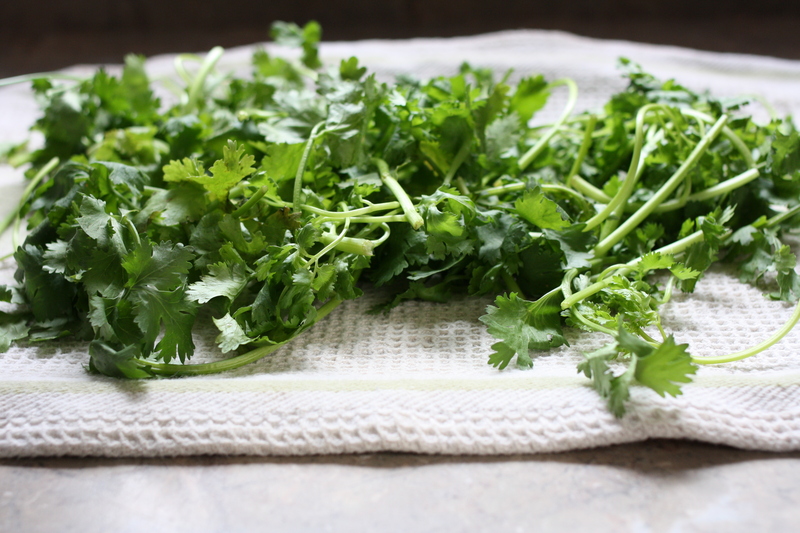 The greens should be detached from the roots before storing in the refrigerator as the tops will wick away moisture from the carrots themselves. Peel the carrots and cut them into fun shapes of equivalent size, approximately 1/2 inch thick. Place in a large saucepan of salted water and bring to a boil. When the water is boiling, reduce to a simmer and cook for about 10 minutes until just tender. Drain and leave out. Heat the olive oil in a large pan and saute the onion for 12-15 minutes until soft and lightly caramelized. 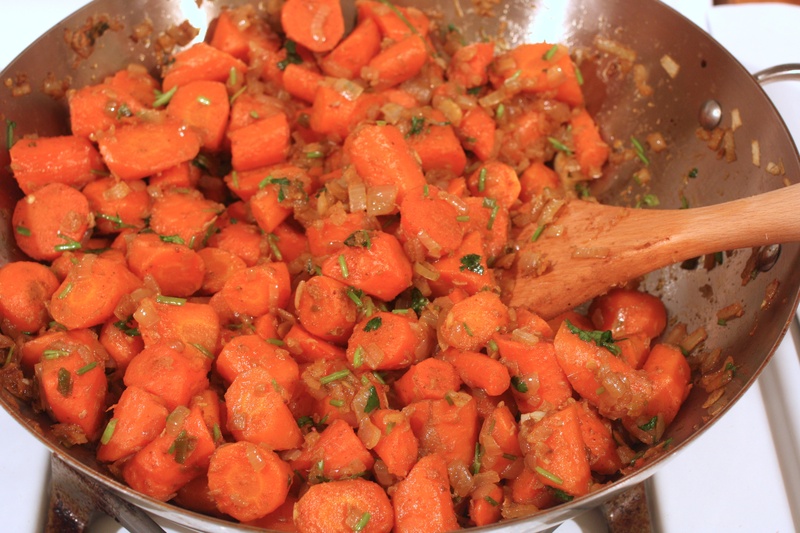 Add the carrots to the pan, followed by the remaining ingredients except cilantro and yogurt. Remove the pan from heat, season with a hefty dose of salt, stir everything together well and allow to cool. 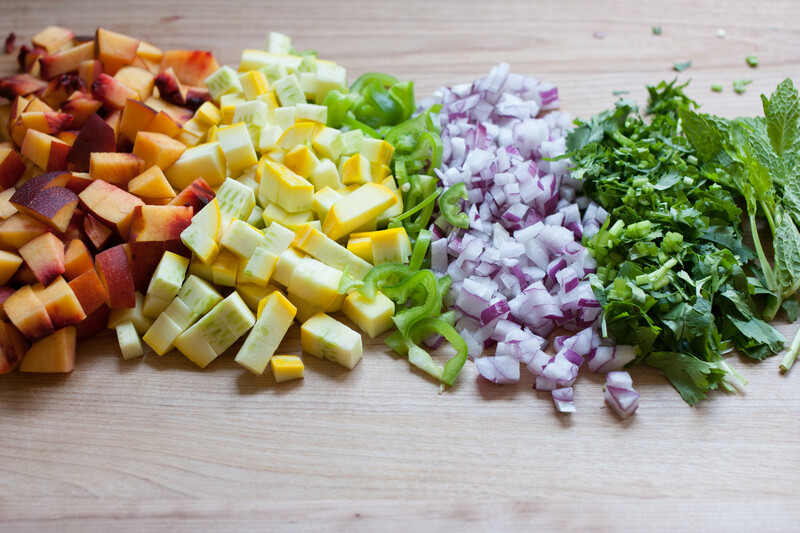 Before serving, stir in the cilantro, adjusting the seasoning to taste in necessary. Serve as a delicious side dish or fresh crunchy snack, along with a spoonful of yogurt, shake or two of ground sumac, a drizzle of olive oil, and extra cilantro. I have always had a soft spot for layered dishes, its beautiful when the many elements of a dish can build on one another harmoniously. Traditional french desserts often employ a layering technique to entice the diner with perfectly executed layers of decadent fillings, providing not only flavor, but textural contrast to each bite. 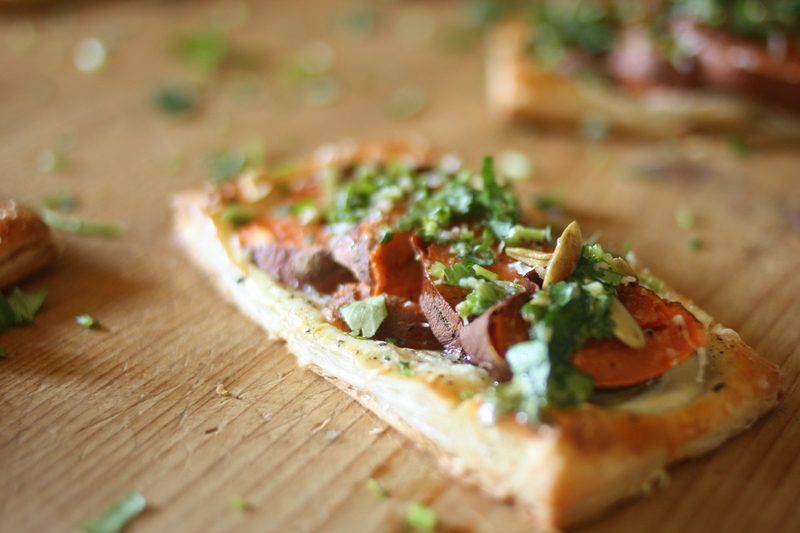 Rustic savory tarts and lasagnas are even better in my mind, the home-made element of this layering creates slight anomalies in the spread of ingredients and makes each bite slightly unique. Allowing the diner to experience different combinations and quantities of flavors in unison, and to quest for their perfect bite. 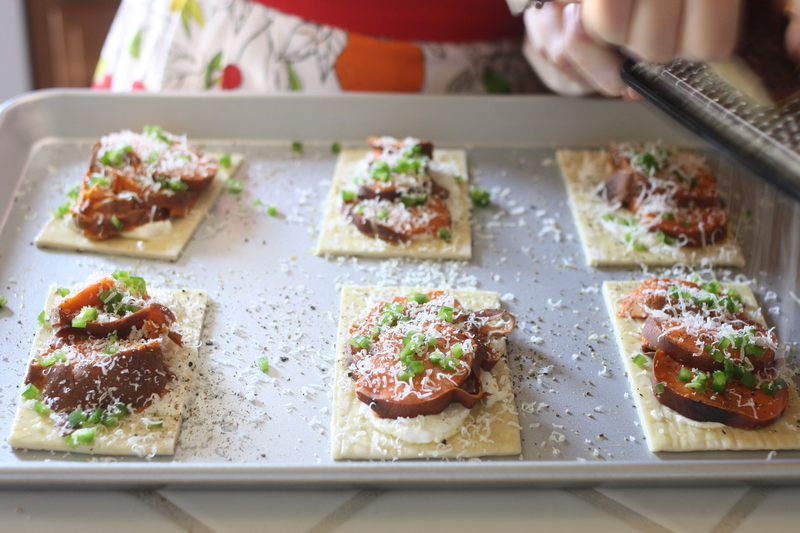 This sweet potato tart, inspired by a recipe found in Yatam Ottolenghi’s first cookbook titled “Ottolenghi” fits squarely into that quirky, imperfect category that I so love. There really are just so many things to love about this dish. 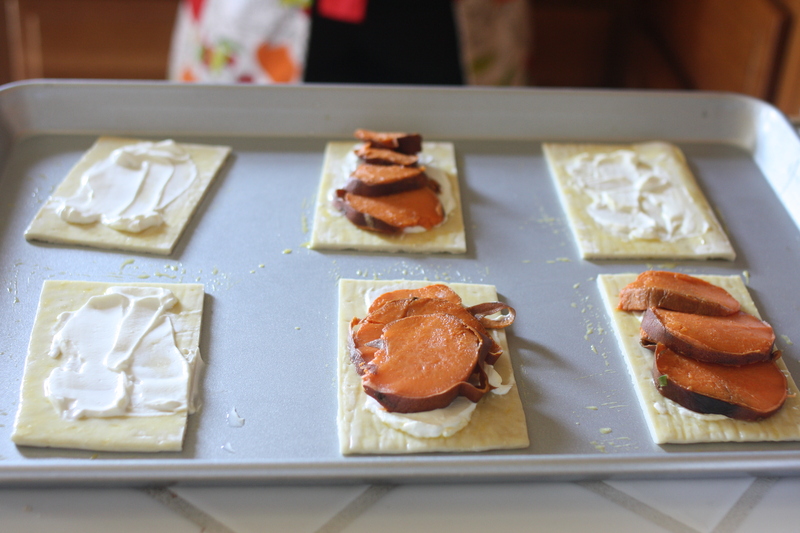 The hominess of sweet potatoes contrasts beautifully with the refined puff pastry. I use store bought pastry from Trader Joes which is really almost as good as store bought pastry gets, it is only a hair less superb than the ultra supreme DuFour Pastry which Whole Foods carries, but costs only a third of the price. I stock up on TJ’s puff pastry so that I have it on hand when I need to pull off something impressive looking for a party in a hurry. Now, if I am being perfectly honest, I don’t think that I could call this dish “healthy” but as far as fancy looking party appetizers are concerned, they aren’t all that bad either. The sweet potatoes themselves are actually quite good for you, they are great sources of beta carotene, vitamin A, vitamin C, and a number of B vitamins. 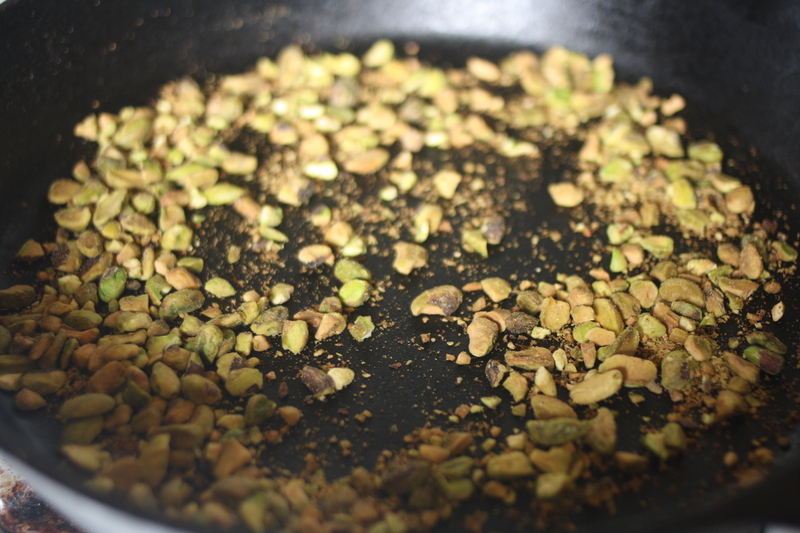 Pumpkin seeds, often called pepitas, are also on the healthy side of the fence in this dish. The small seeds, which typically come from a pumpkin or other small gourd, are great sources of manganese, magnesium, and iron. Not too shabby for a decadently delicious appetizer. For this recipe you want to select two fairly evenly shaped sweet potatoes, about 2 inches wide by 5 inches long. Preheat your oven to 400 degrees. While the oven heats scrub each potato under water with a potato scrubber. Lay the potatoes flat on a cutting board. Puncture each on the side that rests facing up several times with a knife. Place in a baking dish and roast in the oven until quite soft and sweet smelling, about an hour.Remove from the oven and allow to cool in the pan on a rack. If using frozen pastry dough (highly recommended) remove the dough from the freezer and lay a single sheet out on a cutting board. Cut your pastry dough into 2 inch by 4 inch rectangles. Whisk an egg with a little bit of water and brush lightly on pastry. Allow it to dry for 2 minutes before spreading a light layer of sour cream onto each pastry, keeping a centimeter or so rim clean around the edges. Place a few slices of sweet potato on each slice. Top with a slight sprinkling of chopped chilis, followed by a pinch or two of salt and a few grinds of pepper. On top of this layer the pumpkin seeds and a fine grating of cheese. Bake in the oven until golden, about 20 minutes. While the tarts bake mix together the garlic, cilantro, oil, and lime juice in a bowl, add a small pinch of salt and pepper and set aside. Check to make sure the bottoms are cooked and crisp, not clear and soggy. Allow to cool on the pan for a few minutes before drizzling some of dressing mixture (there should be a light drizzle, be careful not to drench them.) 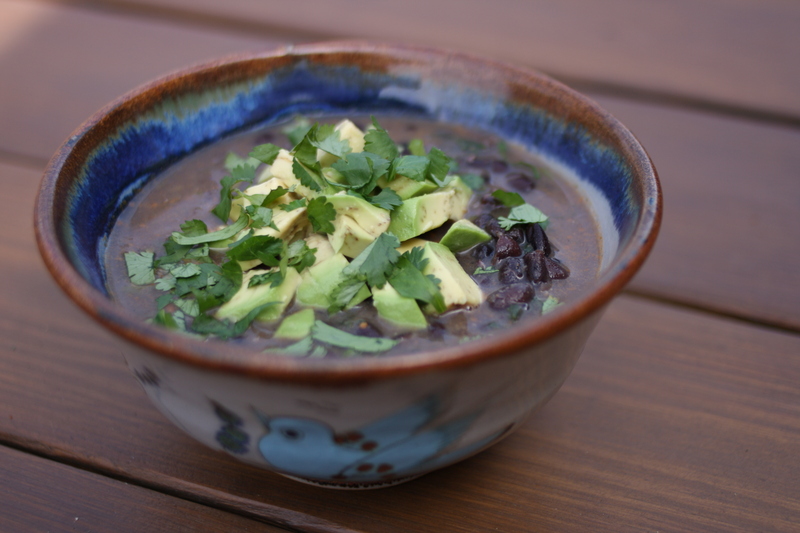 These can be served hot or cooled slightly to just above room temp. When the going gets rough, the tough eat curry, or at least I do. It might seem a bit odd to some that curry is my comfort food but I grew up in a quasi Indian family. By this I mean an Americanized, but notably not American Indian, household that was neither strict nor religious but which held dear a love of all things garlicy, oniony, salty, and spicy. All holiday celebrations featured a big batch of my dad’s single curry recipe, which he concocted shortly after moving to the US back in the 60s. The dish falls somewhere between Thai and Indian and reflects what was a vast unavaiability of Indian ingredients and spices that are now almost ubiquitous in the many Indian markets that can be found all over the US. While generally a man of very, very, few words, occasionally I can get my dad going on stories about his early years here. He initially moved here to attend graduate school at Cornell, he will typically note that in comparison to the university education he received at India’s notoriously tough IIT, Cornell’s Graduate Engineering Program was a bit of a breeze. Which was convenient as he quickly decided that it was far too cold to venture out of his room to attend lectures. In addition to missing the significantly more temperate environment of India’s Maharashtra region, my father longed for the pungent and familiar flavors of Indian cuisine. Its is funny, though not surprising, that as more and more first generation Indians have emigrated to the US, the availability of authentic Indian cuisine has skyrocketed. Even in the middle of the country, in Nashville TN, there are several decent Indian restaurants that feature slightly Americanized versions of Indian dishes. And at least 20 Indian stores are scattered around the city. When I returned from a long week of business meetings, hotels, and bland food I could not wait to cook up a big batch of chicken curry. Rather than cooking the heavy creamy curry that my father so often made, when making curries at home I typically look to the lighter, and spicier notes of South Indian cooking for inspiration. 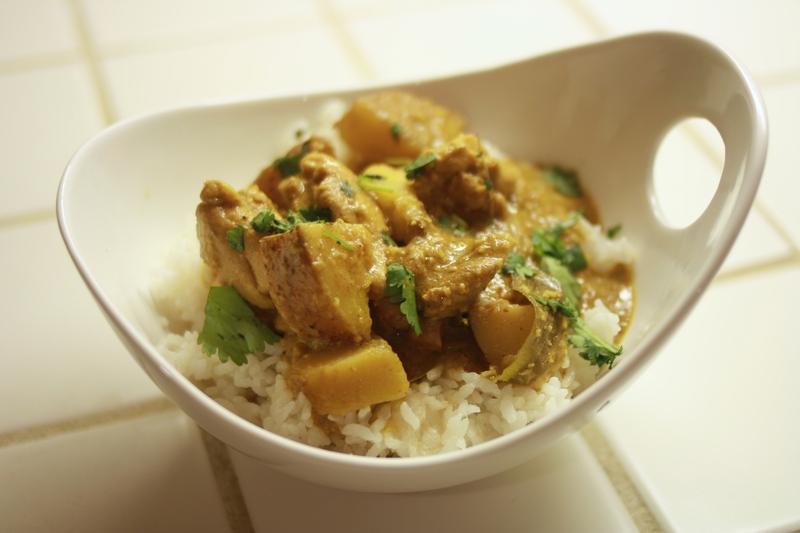 This curry is derived from a recipe I found for a Mangalore Style Chicken Curry. Mangalore is situated on India’s South West coast, just south of Goa. True to South Indian cuisine the curries of the region include the nutty notes of coconut, herbaceous flavors of curry leaves, and creamy taste of coconut milk, all of which can be found in this chicken curry. 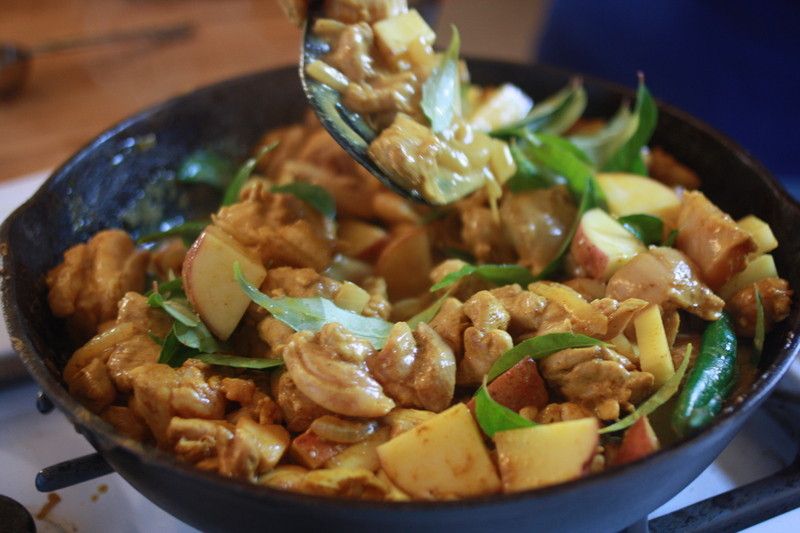 While I made this curry with boneless skinless Chicken thighs, you can use any chicken you like. I prefer to use boneless skinless chicken as it makes it much easier to eat, and the lack of skin keeps the dish from becoming too oily. The chicken thighs stand up well to long cooking without drying and impart a nice rich and meaty flavor to the dish. I tend to go a bit heavy on ginger as I like the hot spicy flavor it gives the curry, feel free to reduce the amount of ginger if you are not a big fan. I use one long hot Indian chile, generally a Kashmiri Lal Mirchi Chile, seeds in, cut in half lengthwise. If you don’t like heat leave it out, or seed it, your choice. You will see below that I attempted to cook this in a large cast iron skillet. This made for great photos, HOWEVER, I ended up having too much curry in the skillet and had to transfer it to a large pot so that it could simmer without boiling over. 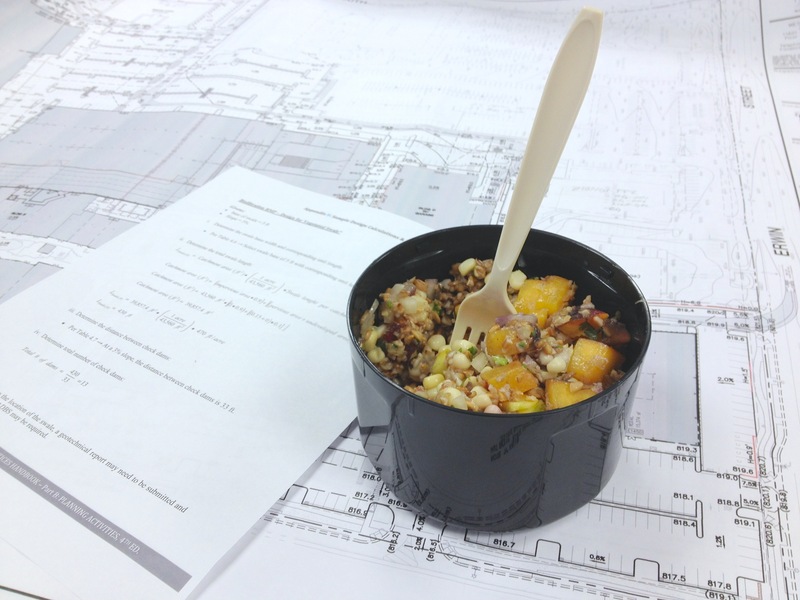 I highly recommend using a large cooking vessel for this project. 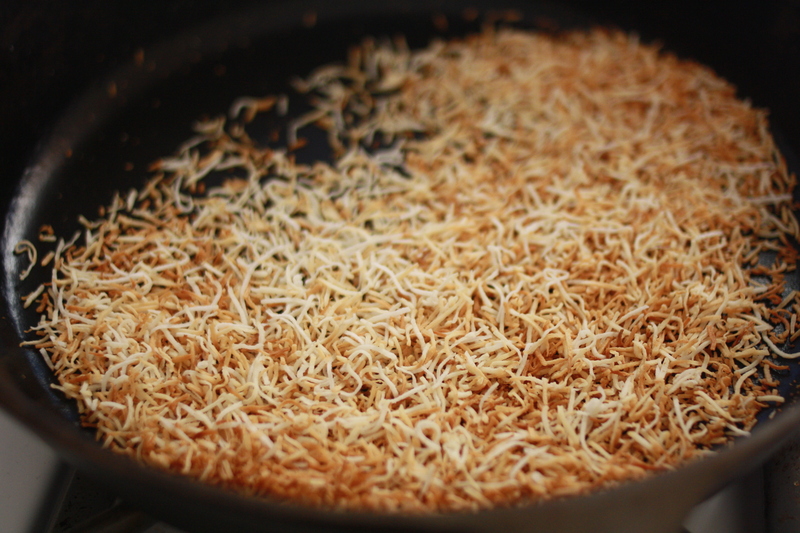 In a large pan, dry toast the coconut until golden. Remove the coconut from the pan and set aside. 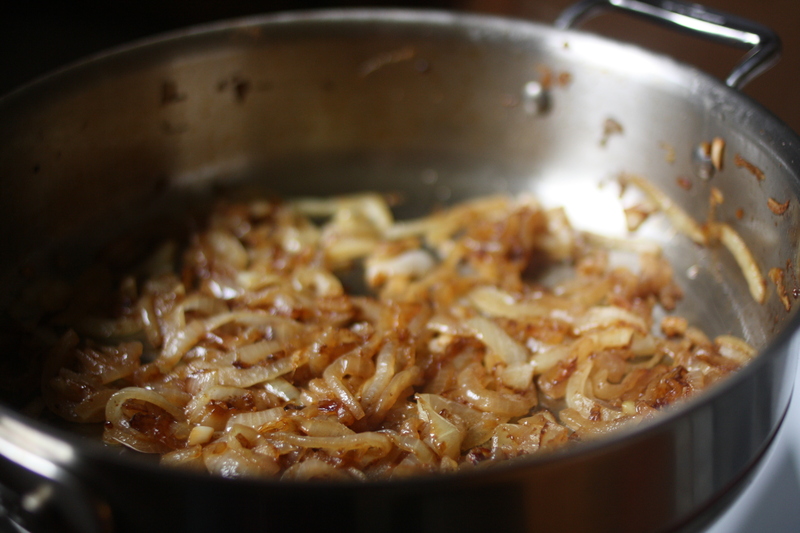 Heat approximately 2 TBSP oil in a large pot, when the oil is hot fry the onions over med heat for about 3 mins. Add the garlic, ginger, toasted coconut and spices and fry another 5 mins. Add coconut milk and stir to deglaze the pan. 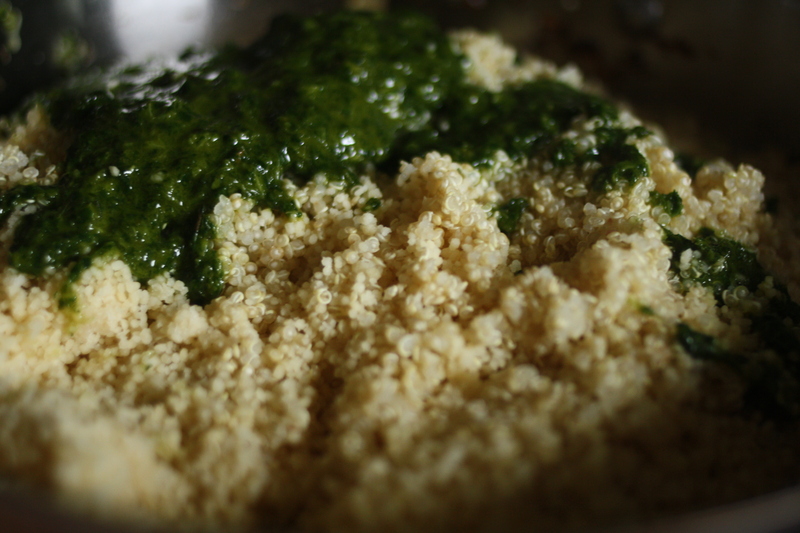 Remove the pan from the heat, transfer to a food processor and mix until it forms a smooth paste. Rinse the pot and dry it. Place it back on the stove and heat 3 TBSP oil until hot. Add chicken and fry over med high heat until seared on the outside. 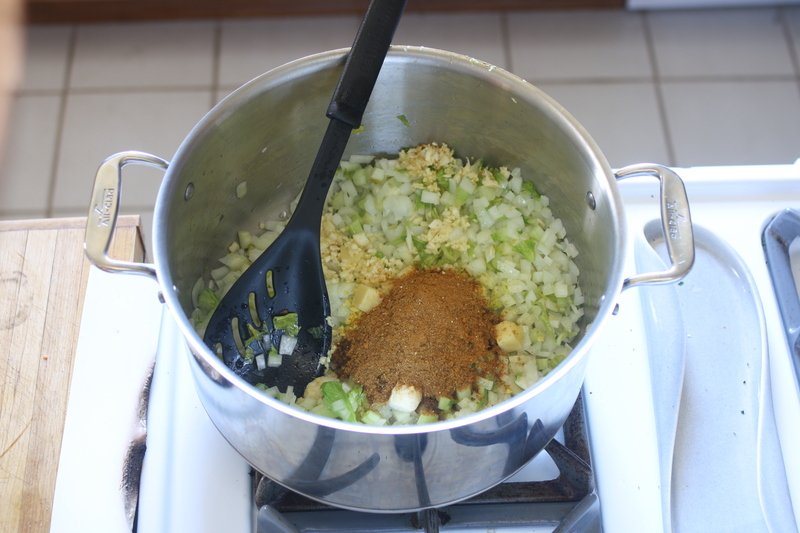 Add onions, chili, potatoes and curry powder and fry until onions are slightly colored. Add curry leaves and tomato paste and fry for an additional minute before adding coconut milk, all of the curry paste, and water. Bring to a boil then reduce to a simmer. Place a lid on the pot and simmer for 30 mins. Taste and add salt and pepper to taste. Simmer for an additional 15 mins. Taste for seasoning again. Serve with rice or nan and enjoy!